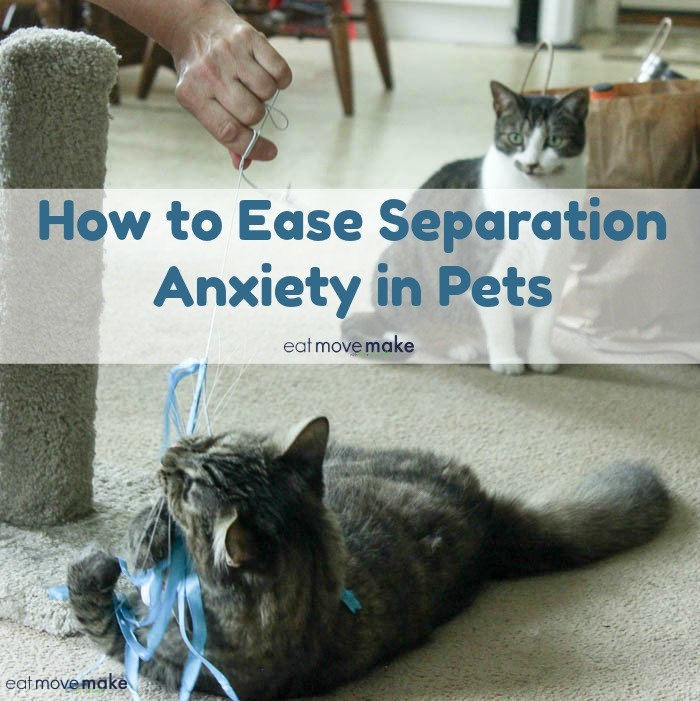 If you have cats or dogs, you’ve probably noticed some pet separation anxiety from time to time. 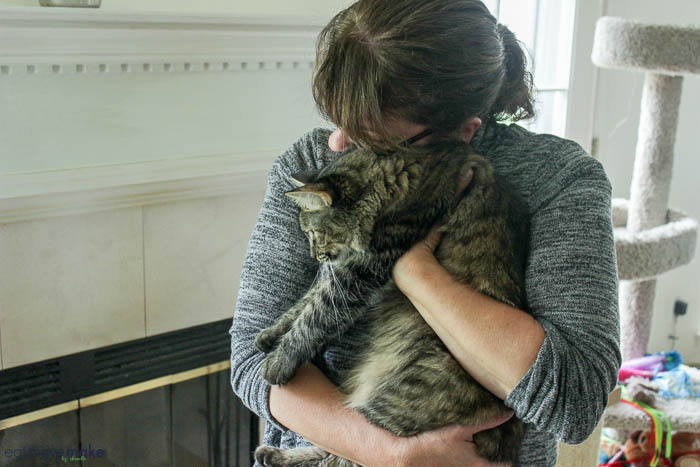 With the arrival of fall, families are heading back to school and work, and pets may start to feel lonely or experience separation anxiety when home alone. Pets are very tuned into us, so they sense when schedules are off and they let you know what they think about it. They may sit inside your suitcase or school backpack to prevent you from packing, or they may ignore you or even express their displeasure with you upon your return. One of my best friends’ cats meows at her angrily for about an hour when she gets home. 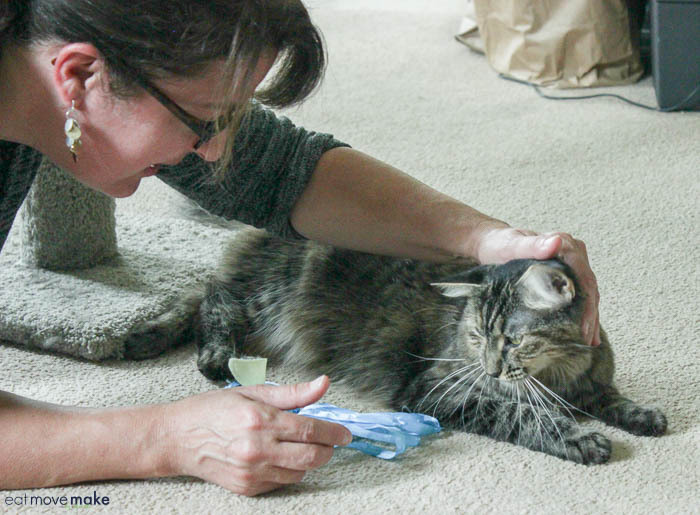 Whether dramatic or subtle, all pets react to change, so I’ve teamed up with Purina to share several tips on what pet owners can do to help address these pet separation anxiety issues. Purina aims to drive the health and well-being of pets so they can live bigger, healthier and happier lives together with their families. Just as people need time to adjust when routines change, the same goes for pets. The sudden extended absence of human companions can really confuse pets and take a toll on them. Being proactive and taking steps to help balance the changes can really help your furry friends remain happy and healthy. Animals are creatures of habit, so help your pets ease into a new normal by quickly creating new patterns and timelines they can count on by leaving and returning at the same time every day. Be sure to allow time for play in your new schedule. When they can count on what to expect, it helps minimize loneliness and anxiety. Pets look forward to our return, so spend some focused time loving on them and playing with them when you get home. It’s a great time to go for a walk or just cuddle! The quality time helps keep pets active, mentally sharp and prevents them from feeling neglected. One of my cats is particularly tuned in to me, and she watches me carefully for signs of impending doom (ie. my departure). All I want to do is baby her and love on her before I go, but I know it’s probably best that I don’t make my leaving a big deal. A lonely pet is often a bored pet, and that can sometimes lead to destructive behavior. A new toy or a novel treat dispenser will help entertain your furry little friend when you’re not at home. 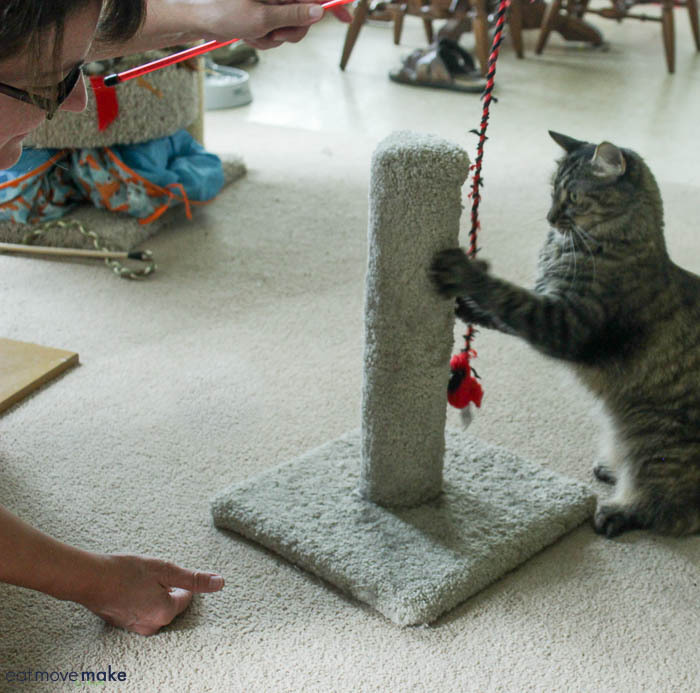 Chew toys for dogs or scratching posts or window seats for cats can help stave off boredom. Encourage playtime when you’re home. 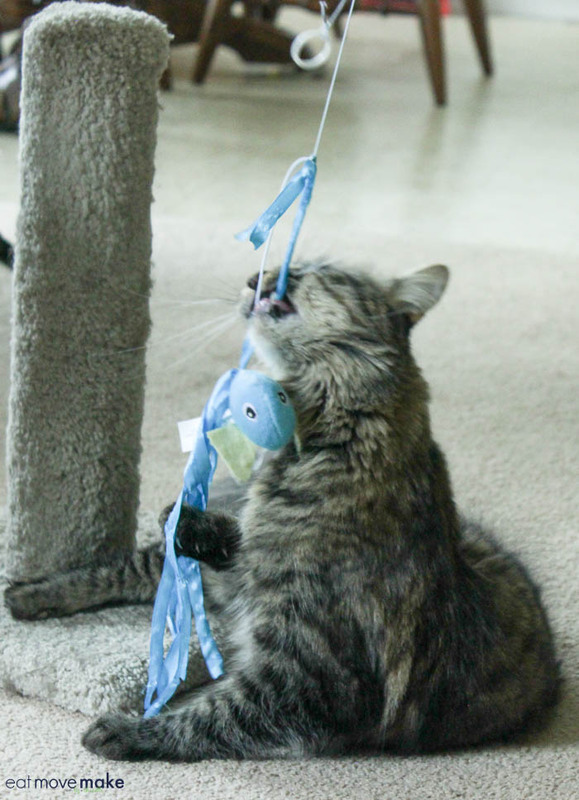 Help your pets release their extra energy and stress by providing opportunities for exuberant play, so they won’t have pent-up energy while you’re away. 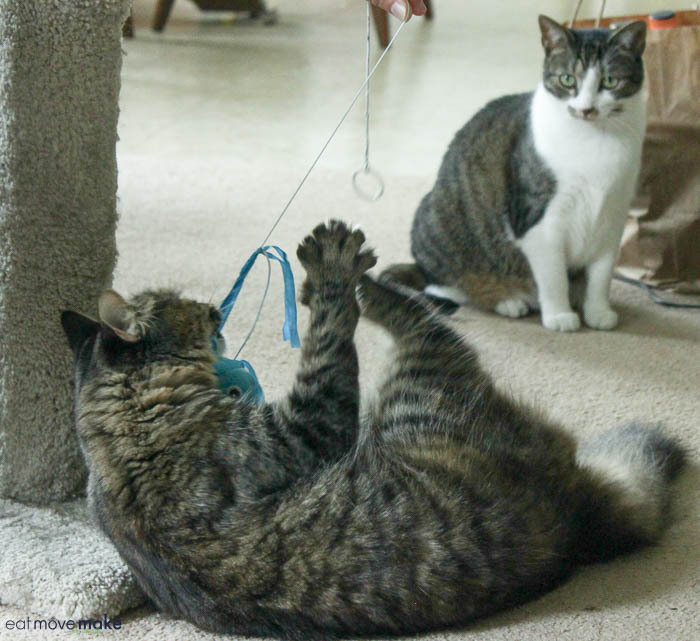 Having another cat or dog around to play with can make your time away pass quicker and help keep your pets happily occupied until your return. As long as you’re considering the feelings of your pets as you make your schedule changes, you’ll find yourself doing the right things to help them adjust as quickly as they can. For more information on pet separation anxiety and how you can address it with your cat or dog, check out this piece at www.purina.com/better-with-pets/7-tips-separation-anxiety and be sure to check out Purina’s recent Facebook Live on this topic. These are great tips, I never thought about separation anxiety when it’s back to school time. My oldest cat has the worst anxiety! If she even sees a suit case, or any type of item that means I’m going to be gone for a few hours-days. She starts to panic :-/ these are definitely some helpful tips! I will have to see if they work on my furbaby. These are all good tips. Our pets are family too, and of course, they do not want to be left alone. I will have to observe if my pets are showing signs of anxiety. Thanks for sharing your tips. I did not know that a change in routine could cause anxiety in our pets. Maybe because there is always someone home that is why I don’t notice any behavior change. I will share these tips with my friends. I think our dog will definitely go through separation anxiety when our boys go back to school. They have spent so much time together this summer. Totally agree with the low-key departure. My dog Freya seems to have a 6th sense about when we’re going out. Even if we just change from pajamas to regular clothes, she starts freaking out. Someone is always home with her but she doesn’t like when anyone leaves the house. We definitely need to spend more quality time with our dog Odin… I feel sorry for him he has been a bit neglected (just in the cuddle department) the past week or so because we are trying to get into a new groove. My mom leaves her cat with a sitter when she visits us and it has been causing some issues. I will share this with her and see if it helps. these are awesome tips! Our pets get wild every time we leave the house and mess up the house. Now we put them in cages. Thanks for sharing! Great tips for pet owners! I don’t have fur babies but it’s good to know there about pet separation anxiety even for animals. I had no idea pets could be so shady to their owner. I get it though; if someone treated me that way I would feel the same way. Great tips. I’m home most of the time so my pets don’t get too lonely during the day. But they miss my kids while they are gone to school. The cat always comes running down the stairs as soon as they get home! I love all of these tips. I’ve always tried to make it easier on the animals when we have to head off. I had to learn how real this was just recently. My cat got malnourished because we were gone for a week and even with a babysitter there 24/7, it wasn’t us. If we are leaving we usually only allow people our pets know to house sit or watch them. This way they feel comfortable with the person while we are gone. 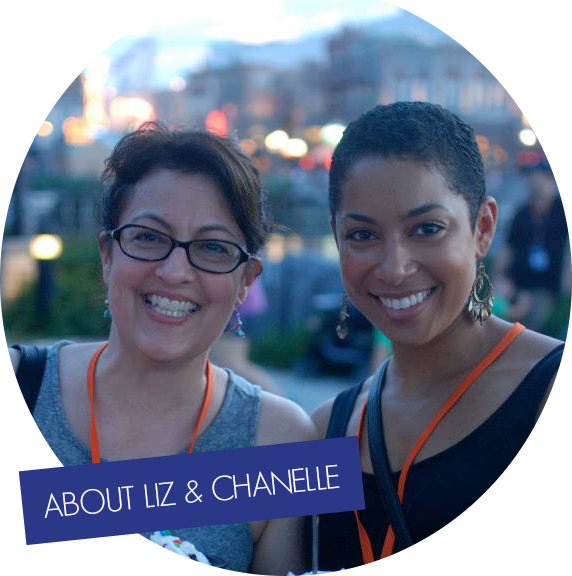 These are great tips for people whose schedule is changing for fall especially back to school. I am lucky I work from home and I can see my dogs all day long. I’d never thought of how kids going back to school would impact pets. This was an interesting read. I think my dog needs this tips! He seems lonely since the school started. Thanks for sharing this! It’s really important to have toys to keep them busy and to make sure that they have something that will help calm them down. I think these are really helpful tips for any pet owner. I always wonder what the pets do while we are away. I am sure it’s a lot of sleeping, but the moments when they feel anxious must be awful. These are great suggestions! These are great tips! We don’t leave the house all at the same time so there’s always a family member that’s with the pets. But whenever we travel as a family, we make sure that they’re in good hands. These are great tips. It’s hard for everyone to adjust to back-to-school routines, and it’s no different for our pets. Luggage. She knew that we were packing up and leaving for a trip. Amazing how Intuitive animals are. I am lucky to have an awesome baby sitter for my dog, Riley. My husband and I travel a lot but we can’t always take him with us so we make sure someone’s looking after him. Aside from that, these are great tips! These are all good tips. Now that my daughter is in college, one of my dogs likes to sleep in front of her bedroom door. We are trying to break that habit, so we put his thunder shirt on for extra comfort then cuddle with him on the couch. I remember when I worked out of the house, we did have a cat that was always happy when I got home. One of the things I love the most about working from home is being able to see my pets all day. That’s a great benefit of working from home! You can stress less about your pets during the day. You offer some great tips for helping pets with anxiety. I know my three dogs hate when we leave the house, and we homeschool! My dogs totally get upset when the kids go off to school. They walk around our house in circles. One of our cats gets really anxious when I am gone. Keeping departures low-key is a great tip. These are great tips, I am sure the pets don’t have as much companionship with back to school season. Especially pets who have been given so much attention during the daytime hours over summer break. A subject I really hadn’t even thought about, love the tips! I’ve never even thought about this… my pup will be away from kids for the first time! We will have to give him some extra love! As a dog and cat lover myself, I could not agree that pet separation anxiety is real and needs the proper response. Thanks for sharing some great ideas for how to help our 4-legged friends when an anxiety attack strikes. I keep a stash of new cat toys I keep for when I will have to be away from home for a long day. I have two cats and one seems to have some separation anxiety. I was just thinking about this this morning! My youngest dog was so sad and hiding under the table when we left for school this morning. This are awesome tips! One of our dogs has major separation anxiety. Have to try these tips! This is so helpful! We dont have any pets but my brother and sister in law do so I will send this to them! I never thought of cats having separation anxiety until I got back from my trip to TN. My son and I took a road trip and was gone from a Saturday to later Wednesday night. OMG. When I got home, she was all over me. Woke me up the next morning (which she never does) to her meows outside my door. (I keep door closed because I’m a reseller and cat fur, not a good thing). But I had my Window AC unit on and heard her over that. It was very unexpected! I remember when we looked outside the home, and our dogs had such horrible issues. Thankfully I’m home with them now, since I work from home, and our youngest is here with them since we homeschool. I also like these tips though for just a long day out away from them. Our doggy looks so happy when the kids get home from school it’s evident he misses them. I really hadn’t thought of how back to school affected him. I never thought of the pets when going back to school. I don’t think our cats care much but I can definitely see a younger cat or dog having issues of no longer having the constant companion. These are some great tips too! I love the idea of getting a new toy. I actually never really thought about my pit having anxiety when my kiddos back to school. She is acting a little bit more nervous especially in the morning when we are going through our routine. This is very interesting. Do you know I hadn’t thought about how it may affect pets when it comes to back to school time, but it makes complete scene that it would, these sound like some great tips to help pets who it does affect. Aw, these are such sweet kitties. I have two cats, one of which doesn’t care if we leave or not. The other can be moody though, so we always tell her goodbye and make sure to play with her when we return. Otherwise she bites. Keeping pets occupied is the way to go. I love the idea of a new toy and even a new pet friend. These are great ideas to ease separation anxiety. Great reminder that our pets have a change in their routine as well as the rest of the family. Will share with my friends who will be going through this with school starting. We opted to get a second pet when we noticed our dog was lonely. She would scratch at the carpet by the door while we were away. Once she got a “sister,” the problem went away! We always had issues when going to work. One day the dog tore up both the couch and our bedroom pillows! I love these tips. It only makes sense that our pets would have some separation anxiety when the kids go back to school. They’ve been getting so much extra attention during the day with school out. These are such great tips. My two dogs love the summer break because they get so much more time with the kids. It’s hard on them when they have to go back to school hours.